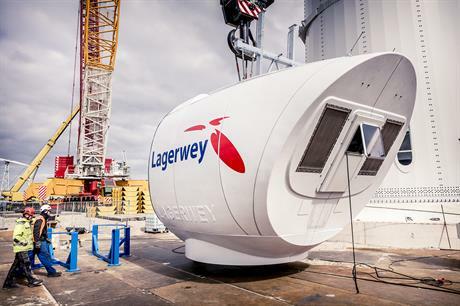 In the latest issue of its company Windblatt magazine for distribution at WindEurope's exhibition in Bilbao, and the international Hannover Industry Fair, both taking place early April, it reports that Lagerwey, which Enercon took over at the end of 2017, will be completely integrated by the end of this year. This means Lagerwey disappears as a brand name, but the name will remain as an innovative development unit within the Enercon Group. The first turbine models Enercon and Lagerwey jointly developed — based on Lagerwey’s (L136) LP4 direct-drive platform — will soon be launched under the Enercon umbrella. This is set to begin with an E-147 EP5 and E-160 EP5. The new EP5 platform name further suggests higher 5MW+ ratings for these two new flagship models. The article indicates that first big contracts for the 4.5MW L136 LP4 and 4.3MW L147 have already been signed, and that client discussions on the new EP5 platform have already begun. The article finally states explicitly that Lagerwey’s PMG technology is also conceivable for future use in Enercon turbines. Additionally, components of Lagerwey’s 2.5MW L100 EP2 turbines destined for a major Russian project it brought in during the 2017 takeover are now starting to be produced at Enercon facilities in Germany.